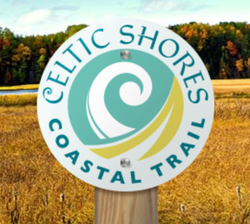 The 92-km Celtic Shores Coastal Trail stretches from Port Hastings to Inverness on the west coast of beautiful Cape Breton Island, Nova Scotia. Explore the best of Canada’s seacoast as you journey along the trail where awe-inspiring natural beauty is matched by the vibrant celtic culture of our region. This exceptional trail system meanders along the coast providing first-class trail experiences for bikers, hikers, runners, quadders, skiers, snowmobilers and horse-back riders. 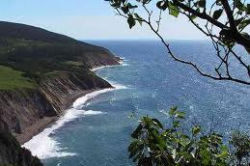 a aWest Mabou Beach Provincial Park - Colindale Road, West Mabou. "Using old roads and trails in this area, the Cape Mabou Trail Club, has built a well-maintained and well-marked trail system that offers tremendous views and a considerable variety of terrain, from easy walks to very strenuous hikes, along coastal trails, up and down the many mountains, and through the forest. " MacFarlane Woods Nature Reserve protects an excellent example of a rich, old-growth Sugar Maple-Yellow Birch-Beech forest. It also hosts rare plants. 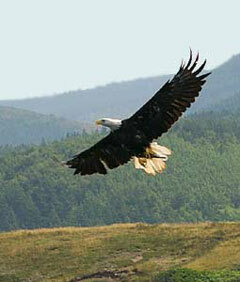 It is located in the Mabou Ridge above the Mull River Valley. Hills and valleys, natural landscape. The hardwood forest of MacFarlane Woods is part of a virgin stand. 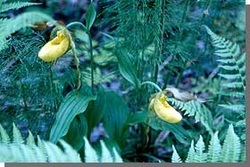 The old-growth forest is surrounded by a variety of early succession stands which are utilized to promote natural history education for visitors. The original 52.5-ha MacFarlane Woods Nature Reserve was designated in 1988 at the generous invitation of the landowner, Mr. James St. Clair, of Mull River. In 2001, Mr St. Clair offered to add more of his land to the nature reserve. Between 2001 and 2004, the Nature Conservancy of Canada and the Province of Nova Scotia purchased four adjacent properties, and in 2004, these plus Mr. St. Clair’s additional lands were added to the reserve, bringing it to its present size of 132 hectares. 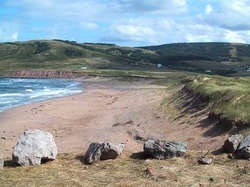 West Mabou Beach Provincial Park - Colindale Road, West Mabou. The only public access beach in the Mabou area is part of a natural environment park with a beautiful large sandy beach and dune system at the mouth of Mabou Harbour. The park also consists of old farm fields and marshes, with several walking and hiking trails and a picnic area. Ample parking along with change houses and pit toilets and a small interpretive site can be found at the beach head. Fishing is permitted in tidal waters and does not require a license There are limits and restrictions on species. Inland fishing does require licensing and it can be purchased at The Brook Village Store. The Inverness South Anglers Association completed 2 major stockings of trout throughout the Mabou watershed in 2004. We are taking bookings for the season which runs approximately August 15th to October 31st. This is a day trip which includes food and beverages. Please call us for rates. This is a highly regulated catch-and-release sport fishery. During the late 19th century and for the 1st half of the 20th century, Mabou's primary economic activity was coal mining. Today Mabou is primarily a fishing port for a small fleet of lobster boats, docked at both the Mabou Harbour and Finlay Point wharves. When the season is open fishermen catch lobster, crab, tuna, herring, mackerel, hake, etc. You will also have an opportunity to taste delicious Mabou oysters farmed in the harbour. Mabou is home to some of the freshest seafood around. 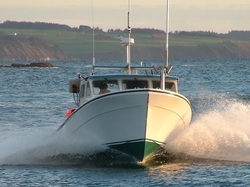 Treat yourself to a self guided tour of Mabou Harbour and the Mabou River. A beautiful setting ideal for beginners or those who just want to get out and enjoy a peaceful morning, afternoon or evening on the water. 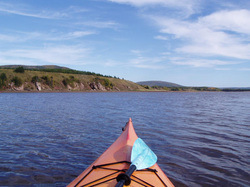 For the intermediate or expert kayaker a full day of adventure awaits, which entails driving to and launching at Finlay Point Wharf (Mabou Coal Mines).